Cooks 8 hours on LOW, depending on crock pot. Serves four to five. 1. Brown meat with the onions in a skillet for a few minutes, and transfer to crock pot. 2. Combine all other ingredients in a separate bowl to create a sauce. 3. Pour sauce over meat and mix around, making sure all meat is coated. 4. Cover and cook on LOW 8 to 9 hours, depending on crock pot. One of our favorites! This is supposed to be served over noodles, but I got busy. There should also be some flour thrown in there somewhere to thicken the sauce, but I forgot. So we shoveled down a steaming bowl of tender meat “soup” topped with Crowder peas for flair. Hearty, flavorful and filling. I especially liked the sauce! Only lasted for 2 meals though + one lunch for me. Hail to the Hungarians! You have turned me into a crock pot convert and I thank you. This looks great. What are Crowder peas? denlyn3—Yippie! And I’m going to use the coconut milk in my tomato soup from now on! Crowder peas must be the “southern” term for cow peas. Does that sound more familiar? Thank you so much for your kind comments and “likes.” I appreciate it! OK, what is a cow pea like? it sounds like a gulash my mom would make. she always adds more veggies though, like bell pepper, carrots and fresh, peeled tomatoes intstead of ketchup. minus the Worcestershire sauce as we don’t have anything like that in Poland. maybe a little bit of vinegar but that’s it. I would try this recipe but our slow cooker is broken and we have to send it back! Oh, girl. Your mama’s sounds much better than mine. More variety and with more veggies. I especially like the peeled tomatoes instead of ketchup. We’re growing tons of tomatoes this year for that very reason. I’m going to make my own ketchup! I know a good recipe for homemade ketchup. I’m going to look for it right now. It’s from one blog you might like! Its gonna be great! Thanks for the ketchup recipe. Matt said thanks! 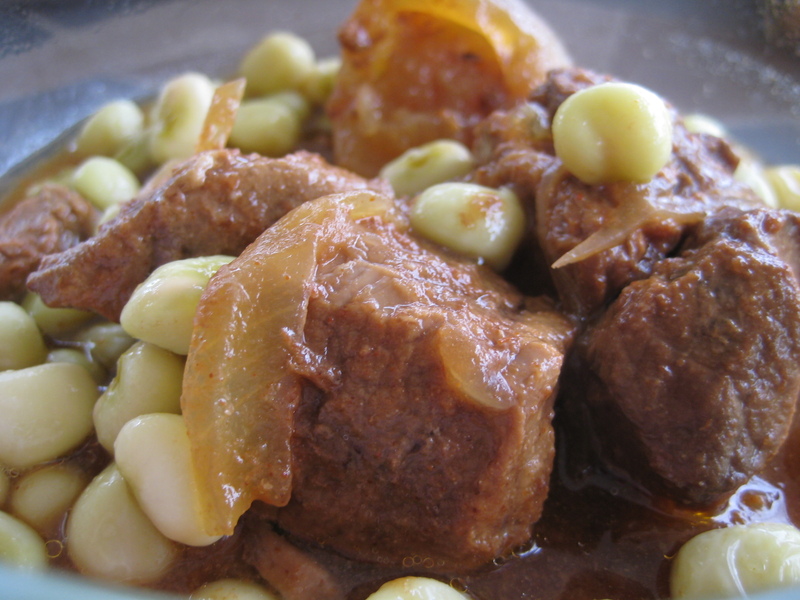 Denlyn3–did you ever shell peas at your grandma’s house? The long bean that you have to open with your fingernails and all the little beans fall out. The peas are short and round, but not as green as the green peas. I have them on the picture at the top. Not ringing any bells? Looks like it is delicious! I’ll make sure to give this recipe a try. @Grandma Kat and Jack—thanks for the visit and encouragement! I wasn’t a vegetarian when I live din Hungary and was blow away by a traditional goulash cooked in a large cast iron pot over an open fire in someone’s back yard. The most amazing meal and a very good time was had by all.